Specify for moderate use restrooms: commercial, healthcare, foodservice. Restroom partition doors, stiles and panels: 1" finish thickness, 3ply, 45lb density, resin impregnated, impact-resistant particle board construction; scratch, graffiti and corrosion resistant 0.050" thick, plastic laminate edges and surfaces. Threaded inserts are factory installed for securing hinges. New vandal resistant, pin headed Torx screws for mounting door hardware (available Fall, 2000); saves installation time and costs. T-nuts are factory installed for securing door latch. All configurations. 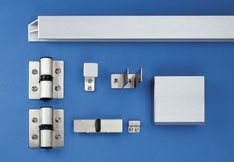 Extra heavy duty, type 304 satin finish stainless steel; angle brackets, U channels and spring loaded, self closing hinge run full height of panels and doors; for emergency access, door lifts from outside; all fasteners are new pin head Torx screws; patented, one piece shoe conceals stile leveling device.